This past week we had an excavator take our Sewer line, and connect it to the sewer in the street. We got lucky, and they found the branch from the previous house at the curb. This saved us from digging up the roadway. Here you see (picture) a directional boring machine putting in a line for the water main from the curb to the house. A directional boring machine is basically a big drill that can be steered as it moves underground. Pipe lengths are added on as it goes, as necessary. A second person tracks the location and depth of the drill head with a sensor, and calls depth and location back to the drill operator who makes adjustments. Here is a video showing how it steers. Drilling is a combination of water pressure and rotating the metal bit. Once it pokes back up on the other end, the water pipe (or any other) is attached, and the whole thing is reversed and dragged back through the hole it made bringing the other pipe with it. This way you don't have to dig a trench. We wanted to limit damage to any tree roots from the birch tree seen beyond. 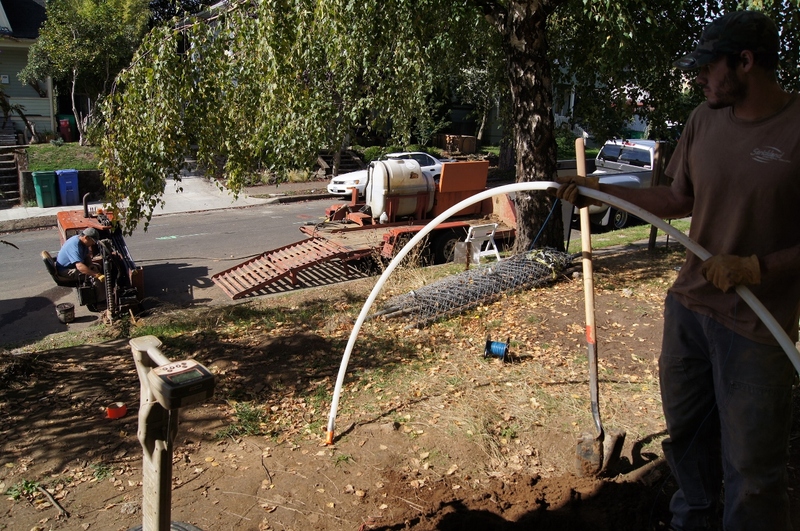 Now that our water pipe is at the curb, it can be connected to the water meter that the City will install tomorrow or the next day. Similarly, we bored in a gas line conduit. The gas company will connect to the line in the street, install a meter beside the house, and run a line through the conduit between them that we just put in. This is also scheduled to happen in the next couple days.